I’m a big breakfast person and one thing I love to have with it is fresh fruit salad! When I was living at home or returning to my parents place during Christmas break (while at university) I’d be one happy camper when my mom would make a big bowl of it! It’s been months since I’ve made fruit salad for myself so I thought it was about time to get some fruit in a bowl and mix it together. For this Cranberry Citrus Fruit Salad I combined grapefruit, tangerines, chopped pineapple and dried cranberries. I was originally going to use sliced bananas instead of cranberries but nixed that idea. The cranberries add extra color, their bitterness works well with the sweet fruit and I like their chewy texture. For a topping I used Greek yogurt and man was it good!!! Greek yogurt has this amazing creamy texture which works really well as a topping. The only drawback is it’s expensive. Recently I learned how to make my own (on the cheap) using plain 1% yogurt. It’s really easy to do. In my next post I share how you can make your own as well. If you don’t have Greek yogurt, don’t sweat it. This fruit salad tastes just fine on its own! 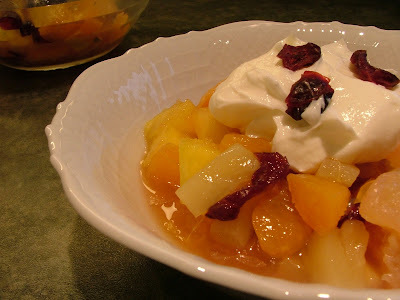 Cooking Song Suggestion: I sort of killed the experience of making this fruit salad by listening to the boring radio. A better option would have been listening to my favorite Christmas tune "Mele Kalikimaka" by Bing Crosby. I first heard this song watching the movie Christmas Vacation and have loved it ever since! 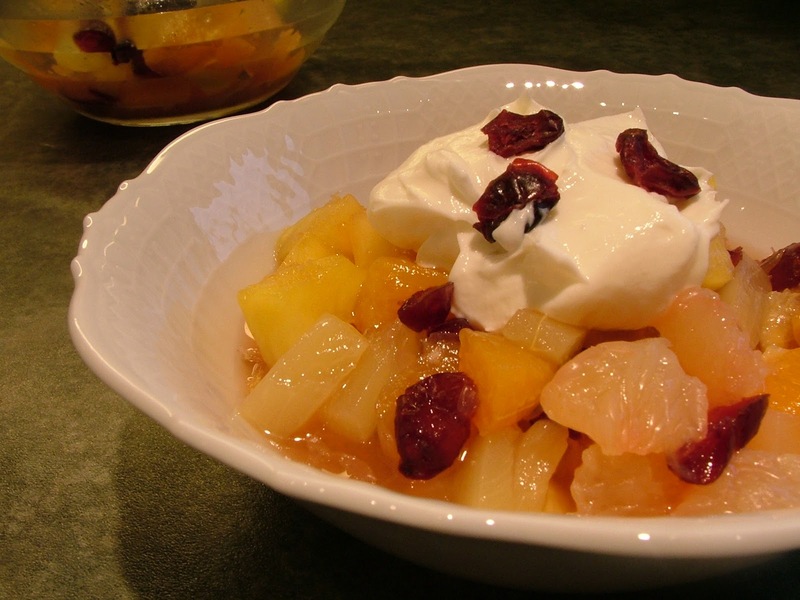 In a medium bowl, combine grapefruit, tangerines, pineapple and cranberries (add the juice you get from the grapefruit). Stir in apple juice and honey. Serve in a small bowl and top with Greek yogurt and extra dried cranberries.